What make’s North Carolina such a good place to fly fish is the abundance of fish and the ability to fish year round. Most of the rivers in the east are filled with hatchery fish, which makes them plentiful. Since they are hatchery fish you will catch a lot of smaller fish to each big fish that you catch. Here is why you want to fish in North Carolina, anglers say this is the best trout stream fishing east of the Mississippi. There are plenty of streams and rivers to choose from beyond what has been listed. You may even try your shot at fishing the tail waters below the dams that are used to produce electricity. The ever-changing environment near these dams brings about some excellent fishing. Word of advice, keep an eye on the water level and currents as they can change rapidly. Be sure to check the North Carolina fishing regulations for any waters you plan to fish, and make sure you get a NC fishing license. There are many fly-fishing guided packages available for the great waters in this state. Below is a list of a few places to try. The Hiwassee River is not as well known as other rivers in the south but it is a great trout stream. The river is one of the best places to fly fish during the winter months. The Davidson River is located about ½ hour from Asheville. The Davidson River is well known and the catch and release section of the river is some of the best fly-fishing on the east coast. The North Rills River is another great stretch near Asheville,in the western part of the state. Located between Asheville and Brevard this river gives you another great option in this area. The Watauga River is located in Elizabethton, which is about an hour from Asheville. This river is widely known in the east as one of the top fisheries because of the high fish counts. The South Holston River, which is located near Bluff City, has some of the biggest fish in the eastern states. The river starts at South Holston Dam travels southwest and ends as it dumps into Boone Lake. Do you have a place you like to fly fish? 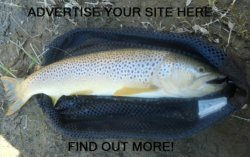 Help other viewers by sharing some great fishing locations or tactics. Please send us your comments. Visit http://www.north-carolina-travel-guide.com it is a well organized, informative "all in one" site where you can come to find all the resources you will need to plan your next trip to beautiful, friendly, North Carolina. NC fishing regulations and license. North Carolina is a great place to fly fish. Click here to choose another state.